Indigenous non-refrigerated methods like heaps and pits are used in India for short-term storage of potatoes (Solanum tuberosum L.) to avoid distress sale. Storing untreated potatoes generally results in high losses from sprouting, moisture loss and rotting. To reduce storage losses by inhibition of sprouting and to determine the suitability of stored potatoes for processing into crisps, a single spray application of a commercial formulation of 3-chlorophenyl carbamate (CIPC or chlorpropham) 50% a.i., (Oorja, United Phosphorus Limited, Mumbai, India) of CIPC (or chlorpropham) was tested on potatoes during storage from March to June under two traditional storage methods [heap (17–33 °C, 58–92% relative humidity (RH)) and pit (17–27 °C, 72–95% RH)] in 2 years [2005 up to 90 days of storage (DOS) and 2006 up to 105 DOS], using four cultivars and two rates of CIPC application (20 and 30 mg a.i. kg−1 tubers). The two rates of application were comparably effective in reducing weight losses, sprouting and sprout growth in stored tubers, and the effect was more pronounced in pit storage than in heap storage. By contrast to untreated tubers, CIPC-treated potatoes remained turgid under the two storage methods and fetched market prices comparable to those for cold-stored (2–4 °C) potatoes after 105 days of storage. 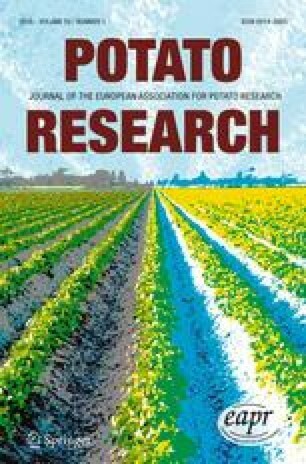 Reducing sugar concentrations in treated potatoes decreased during storage especially in 2006 when the initial reducing sugar concentration was higher than in 2005. Crisp colour improved only in 2005 after 90 DOS, but it deteriorated in 2006 during storage up to 105 DOS. Sucrose concentration increased tremendously during storage in 2 years. Only one cultivar (Kufri Chipsona-1) with low initial reducing sugar concentration and less sucrose accumulation during storage could produce acceptable colour crisps after storage in both years. The remaining three cultivars—with high initial reducing sugar concentration—were suitable for processing after storage in heap and pit in 2005, but not in 2006. 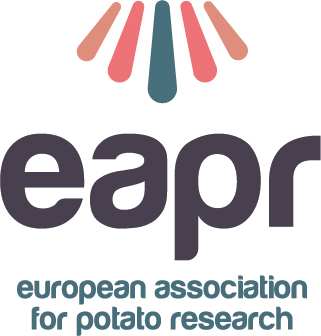 Stored potatoes were safe for human consumption as the CIPC residue concentrations were far below the permissible level of 10 mg kg−1 as prescribed by the European Union. Single spray application of CIPC (20 mg kg−1 treatment) can effectively reduce storage losses in potatoes stored in traditional non-refrigerated methods of heap and pit and extend the storage life by 90 to 105 days. We are thankful to Dr. SK Pandey, Director, CPRI Shimla and Dr. GS Kang, Head, CPRS Jalandhar for providing facilities, Mr. YK Gupta for assistance and Mr. Raj Kumar for statistical analysis of the data. Supply of the ‘Oorja’ sample, gratis, by Mr. VK Singh, Marketing Manager, UPL, Mumbai, India is thankfully acknowledged.